Alexander Ebert stumbles across the stage like a man drunk on his own musicality. But it is his fans who are truly intoxicated by his drug; it’s rare to see a crowd so utterly devoted to their hero. 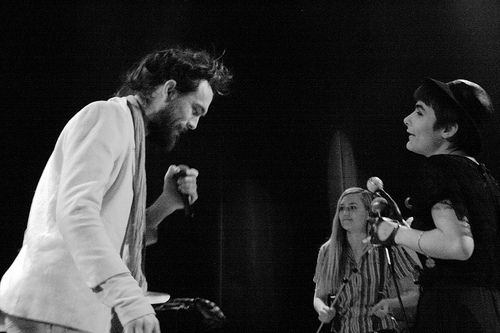 At times, tears were shed, but Edward Sharpe, a blessed fiction created by Ebert himself, spreads his message through a show of sheer joy. ‘If I Were Free’, a musical comment on the nature of personal freedom, highlights Ebert’s intellect and ability as a song-writer. Have no doubt, Sharpe wants the world to change. The sad irony is that Sharpe, as Ebert once said, “was sent down to Earth to kinda heal and save mankind…but he kept getting distracted by girls and falling in love.”Meanwhile, the unrelenting innocence of Ebert’s delivery of ‘Janglin’ makes it all the more brilliantly disturbing, revolutionary yet soothing. The section of the Magnetic Zeros at the back of the stage were their own entity, tight within themselves but on occasion seemed unable to express themselves whilst Ebert’s own magnetism took centre stage. Perhaps with a longer set, their presence could have been developed further. Jade Castrinos, who took centre stage in ‘River of Love’, was curiously reminiscent of June Carter’s look, humour, country vocals and enormous spirit. She is a deceptively gritty delight. As the performance diversified, exploiting the vocal talents of Christian Letts, Ebert’s messianic charm temporarily gave way. But the interlude was short lived. Ebert’s ability to interact with a crowd at a personal level is remarkable. He seems to be able to connect with each and every individual. He handed the microphone to those who had forced their way to the barriers; their sentiments of admiration seemed to echo a unanimous feeling. For a short while the entire audience heard from those fans of Ebert whose devotion borders on fanatical. At times, most notably in ‘Truth’, a track from Ebert’s solo album, ‘Alexander’, the insularity which makes him so appealing threatens to become a frustration. Where lyrics are at their most vital, they have a habit of disappearing into a mumble. But this is the most minor of complaints, a tiny hiccup in an otherwise superb performance from one of LA’s most exciting exports of recent times. Sharpe can hold the hearts, souls and attentions of a crowd magnificently. He draws them in and delights them with an almost unparalleled power.